This document was issued in New Bedford to the vessel Josephine, which was under the command of James L. Chapman. The vessel was heading from New Bedford bound for the Pacific Ocean, with provisions and stores with utensils for a whaling voyage. Captain Chapman had commanded the Josephine on a three-year voyage that ended in July of 1862, during which time the Civil War began and increased the danger for Yankee whalers. Never the less, he returned to sea in command of the Josephine less than a year later. The logbook for this voyage which lasted from April 14, 1863 to June 12, 1867 is preserved in the New Bedford Whaling Museum and is available on-line. After this voyage in the Josephine, he went to sea in command of the whaler Contest in 1864. 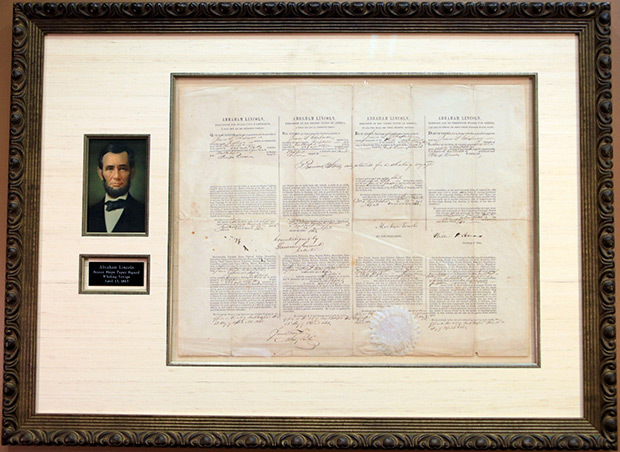 This sea letter in in four languages: French; Spanish; English; and Dutch and is signed by President Abraham Lincoln who served one term during the tumultuous Civil War. He was elected to a second term but only served a little over a month before being assassinated. This sea letter was issued three months after the Emancipation Proclamation and in his address he dedicated the military cemetery in Gettysburg, immortalizing the sacrifice of the Union soldiers to preserve the nation. As the war neared its end he showed magnanimity to the South during his second inaugural address, offering “malice toward none; with charity for all.” The document is also signed by Secretary of State William Henry Seward, whose main agenda was to limit the recognition and support of the Confederacy by European powers. He was only partially successful since the commerce raiders CSS Alabama and CSS Florida were built in Britain and would ravage Yankee shipping, particularly whalers. The document is also signed by the Collector of Customs of New Bedford, Lawrence Grinnell, who served for nine years in the position. He was a key figure in bringing the New Bedford Railroad into existence, linking the active port of New Bedford to Boston. His uncle Joseph Grinnell was the prime mover in this project, but Lawrence was Treasurer of the railroad. Another signer was notary James Taylor. This sea letter is printed on rag paper and bears the Great Seal of the United States on the lower center and the embossed seals of “United States Customs House,” New Bedford center left and the notary lower left.